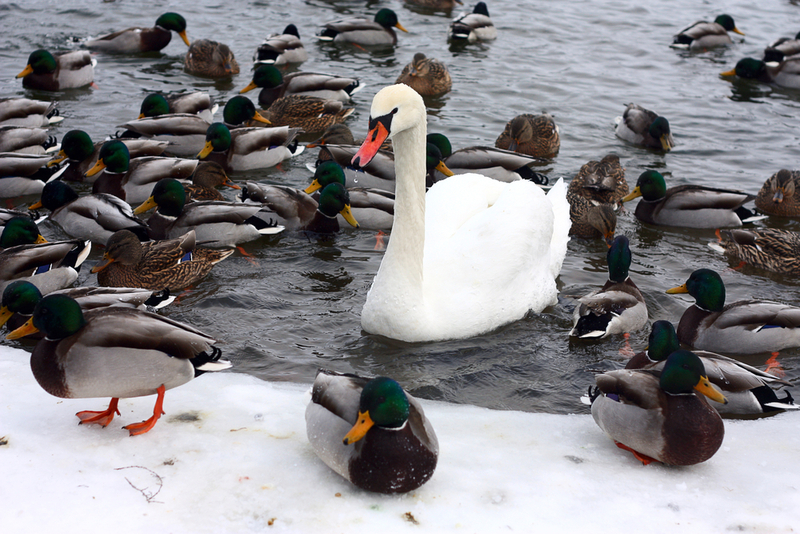 Eddie C. asks: How do ducks and other birds keep their feet from getting frostbite in the winter? How a bird reacts to the cold depends on what kind of a bird it is and there are a variety of methods they use to keep their legs warm, from the mundane to the much more fascinating. For starters, many birds will simply pull their legs and feet close to their centre of mass one at a time, keeping them warm with their feathers and body heat and off the cold ground. Likewise, some birds crouch down and cover both feet with their plumage. In particularly cold weather, the bird can also “fluff up” its feathers, trapping air between the feathery layers to keep extra warm from head to toe, so to speak. If there are other birds around, they may also huddle together when doing this. Another slightly mundane, but also very helpful, method of keeping themselves, and in turn their feet, warm is body fat. Towards this end, some birds will gorge themselves before winter, not just for the extra energy store, but to build up a layer of fat to help shield themselves from the weather. Further, as a last resort, most birds can shiver their flight muscles to generate body heat (not unlike how the cold-blooded honey bee keeps the hive warm in winter), though this comes with the problem of physically tiring the bird and perhaps limiting its ability to fly. Concerning the feet and legs more directly, many bird legs are covered with a rough, scaly skin that limits heat loss, not to mention the legs and feet often have an incredibly small surface area compared to the rest of their bodies, severely limiting the amount of skin actually exposed to the cold. So what about something like a duck with positively huge, flat feet that are not only exposed to the elements, but may be submerged in ice cold water? In these cases, the birds have a nifty trick up their non-existent sleeves. Using a counter current exchange system, some birds can submerge their feet in ice cold water for hours at a time without real consequence. In a nutshell, counter current exchange simply means that the bird’s veins and arteries are aligned in such a way as to facilitate heat exchange between warm blood being pumped towards the feet and the cool blood being pumped away from them. This means that recently cooled blood from the bird’s feet is warmed before it reaches the bird’s core while at the same time blood from the bird’s core is cooled significantly before it reaches the feet. This makes sure they aren’t dually heating the blood returning to the core and the water around their legs and feet with their core temperature blood (often 104 degrees Fahrenheit, 40 degrees Celsius, or more depending on the bird). Instead, the lace-like formation of the birds’ capillaries ensures that a lower, but sustainable temperature is maintained in the feet (sometimes only just above freezing, as is the case with Emperor penguins or ducks swimming in a nearly frozen body of water), allowing it to endure freezing temperatures around their exposed feet, while minimizing heat loss. Further, birds with this evolutionary trait can actually control the flow of blood to their extremities using a series of muscles located at the top of their legs. In extreme circumstances, some can even cut off the flow of blood completely, though only for a short time without damage. They can also go the other way with it when overheated to use their exposed feet and ability to control blood flow to cool themselves down when hot. However, this system is far from perfect and it’s noted that, for instance, if a duck is left in a warm environment before being put directly into a freezing one, its feet can sometimes struggle to adapt and may result in the poor little guy getting frostbite. Yes, despite all the methods of keeping their feet warm listed above, ducks and other birds can get frostbite, and sometimes die from the cold during particularly harsh winters. Will Birds Really Blow Up If They Eat Alka-Seltzer or Dried Rice? The robin has such spindly legs that the blood must surely freeze on the way down to its feet in cold temperatures? Mind – blown. Counter current exchange. Wow.